I'm so excited to share today's post with you guys. 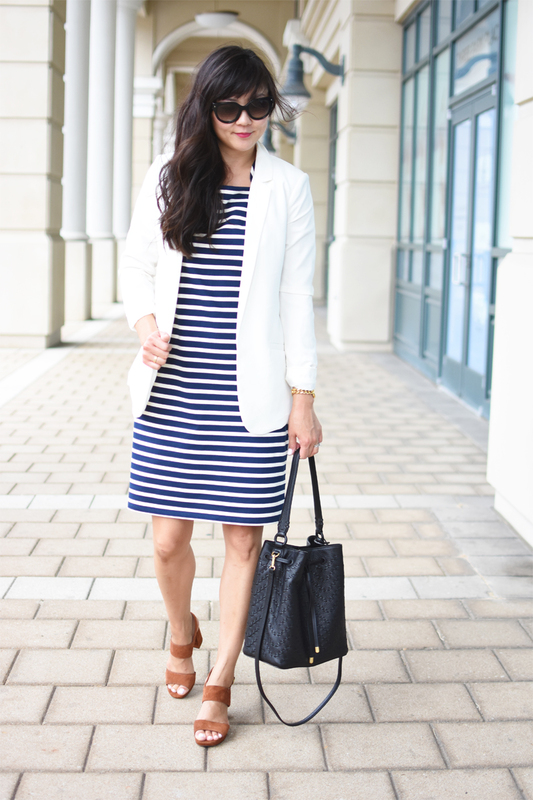 I've partnered with Lauren Ralph Lauren to share this versatile look with you! 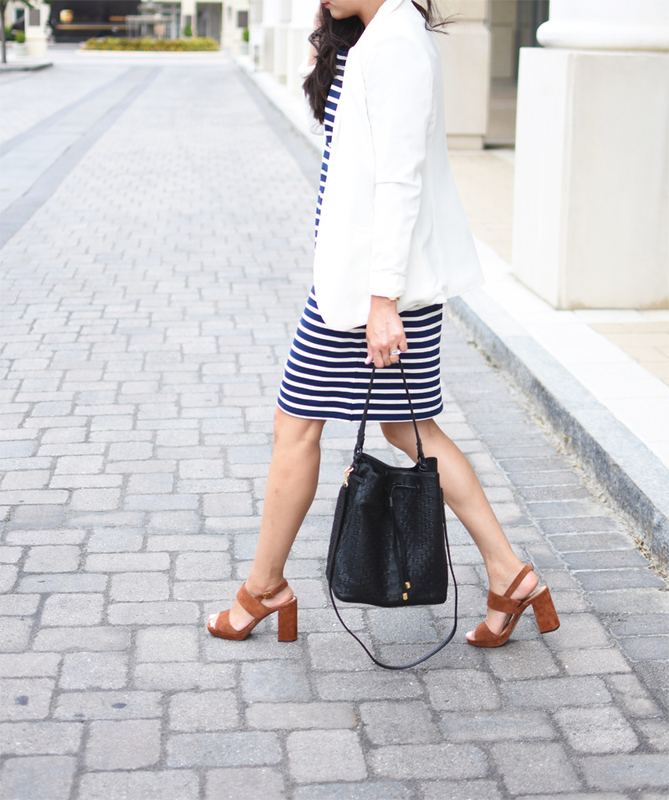 I don't think there is anything more summery than blue & white stripes, right? This striped dress by Lauren Ralph Lauren is the perfect summer dress, with it's blue & white stripes, the ruffled sleeves that can be worn on or off the shoulders, and is machine washable. Can we say yass to that last one? I am all about machine washable things because waiting for things to line dry or get things dry cleaned isn't exactly what I've got time for. I love that this dress is great if you've got a 9-5 job where you need to be a bit more conservative. You can definitely wear the ruffled sleeves on your shoulders, which I've done here in the first few photos. I remember when I worked in an office, it would be freezing inside even during the summer months, so adding a blazer or jacket of some kind keeps it professional and keeps you warm. 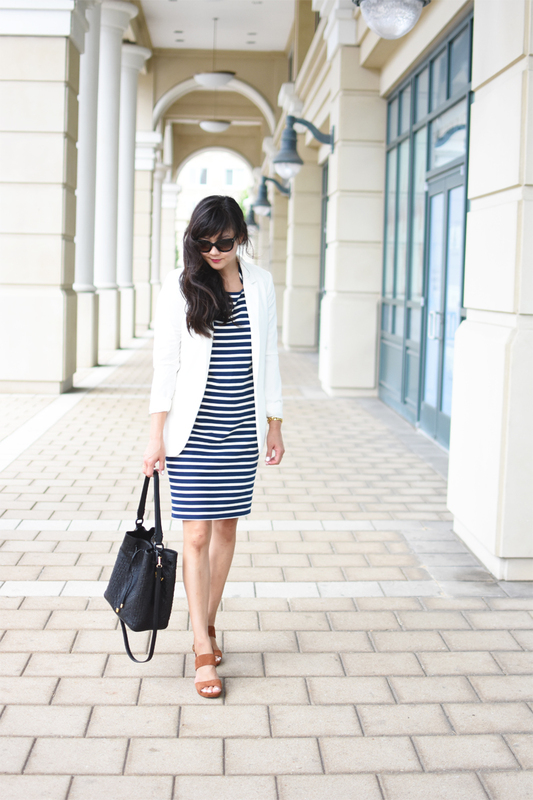 I have my trusty white blazer that I picked up from Zara a few years ago (similar one here), and I think it looks really chic with this dress. Adds a bit of sophistication, no? Then when you're ready for happy hour, or you just want to wear the sleeves off the shoulder, you just slip them down and you're good to go! I also love the length of the dress. It's just long enough where I don't have to worry about showing too much when I'm bending down to chase the kiddos, but short enough that I'm not going to die of heat in the warmer months. 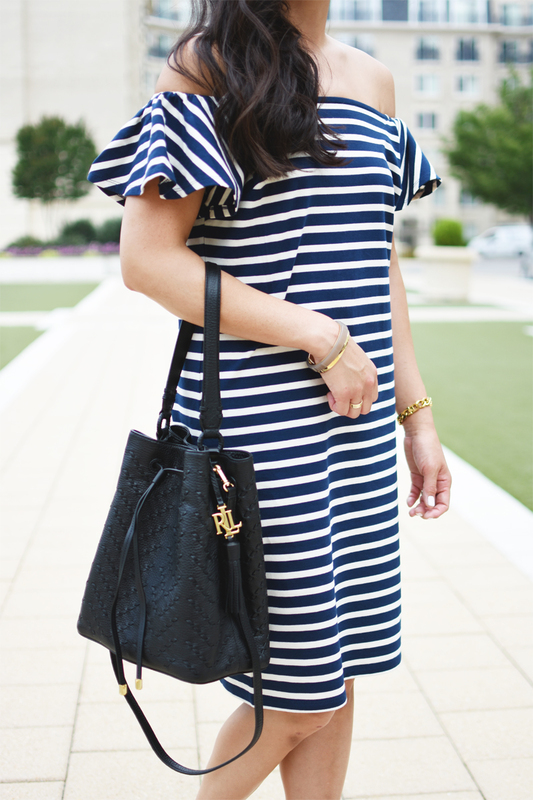 You could easily add a denim jacket or a trench coat for Fall/Spring, that way you can wear this dress year round. And did I mention that it's on sale right now and comes in a red & white color way too? 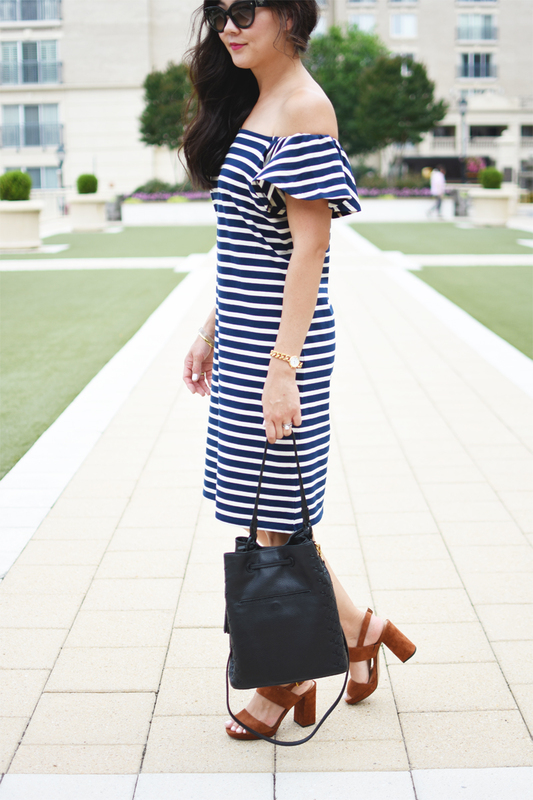 Yup, it's pretty much the most versatile dress you can get right now. Oh golly, I didn't even talk about the bag! I've always been a fan of bucket bags, and I especially love that this one has that woven detail to make it standout a bit more. All of the compartments it has are so handy, love the one on the outside for easy access like my phone. That way I don't have to dig around to find it. And having both a short and long shoulder strap is so great, love the flexibility of having both. 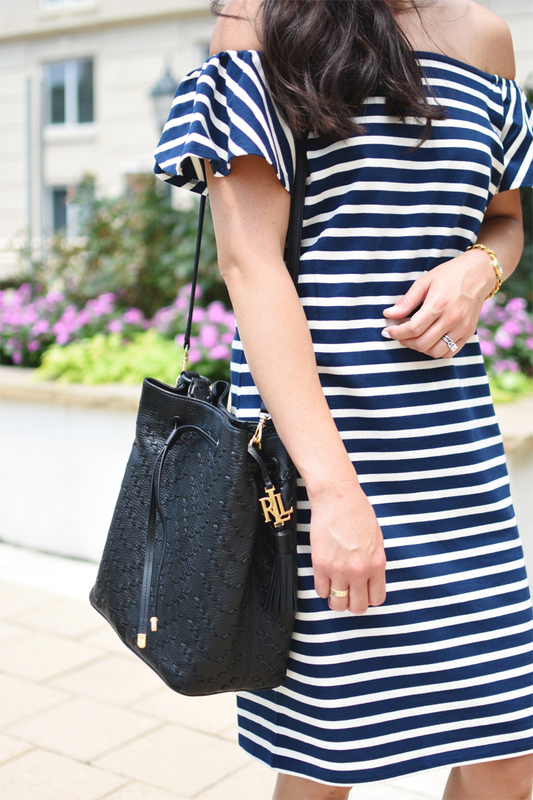 This post was in partnership with Lauren Ralph Lauren and Macys, but all opinions are my own. Thank you so much for supporting the brands that keep this blog going!